Eating Clean is about eating REAL Food in the RIGHT Portions. When we focus on eating clean, often we start with eliminating all the foods we love that we know are unhealthy for us! And this is not only challenging to start, but it's also impossible to maintain because we begin feeling deprived. And if we aren't getting the results we desire, we then become frustrated and resentful, which can lead us off track and right back to our old habits. So how do we learn to eat clean AND enjoy it? 1. IDENTIFY the unhealthy foods you are currently eating. You may already know that sugary foods, fried foods, most packaged foods and sodas are not healthy for you. But you also need to read the labels of foods that are labeled as "healthy" to make sure you are not sabotaging your efforts. ​Use these 5 tips to help you get started in knowing your food better. 2. UNDERSTAND why these foods are unhealthy for you. The better you understand the effects of unhealthy foods on your body, the more your perspective of this food will change. For example, knowing that foods with more than 5-7 ingredients indicates it is highly processed. And highly processed foods cause and increase inflammation in your body, which inhibits your body's ability to burn fat as energy. This understanding will empower you to say 'no' to these unhealthy foods and opt for a more natural and less processed food choice. 3. REPLACE unhealthy foods with more natural & healthier options. We can't just eliminate the unhealthy foods from our eating plan; we must also learn to REPLACE those with better alternatives to help us transition to a better and healthier lifestyle! Try these simple yet satisfying swaps to help you eat clean & enjoy it! Need some FIT & CLEAN RECIPES? Check these out or visit dashingdish.com for some of my favorites recipes for meals, snacks & desserts! We are traveling today, and just wanted to share my top 5 healthy tips for traveling. 1. Do buy a cooler. It doesn't have to be expensive, just functional. 2. Do measure out your snacks into portions. This will help you be mindful of how much you are eating. 3. Do time your eating. Sitting for long periods of time can become boring, which may trigger you to want to eat. Plan to eat every 3-4 hours and only in those intervals to help keep you from over-snacking. 4. Do drink lots of water. I know this may cause you to need to stop more frequently, but it's worth the effort to keep your body hydrated. 5. Do pack a variety of colorful foods & include protein, carbs & healthy fats. To stay alert while driving, opt to eat ice instead of eating seeds. What is your favorite tip to staying on track when you travel? You&apos;ve heard it over and over again, drink more water! Why is water so important?? Drinking adequate amounts of water reduces risk of some cancers and diseases, such as bladder & colon cancer and heart disease. What reason inspires you to drink more water for your health & fitness goals? The goal when you are grocery shopping is to shop the perimeter...meaning, you are shopping more fresh foods and choosing less processed foods. -choose plain over flavored and add fruit, fruit preserves or 1 tsp honey to sweeten. Take time to Your read the labels of the food items you have on hand. Note any items that you find that are not healthy for you. Then take take time to find foods that are healthier alternatives of the foods you shouldn&apos;t be eating. It is very important to make sure you EAT when you are Exercising! It is important that you fuel your body to WORKOUT and also to RECOVER. So the questions become: what to eat & when to eat? While there is not a one-size-fits all answer, there are a few guidelines you can use to personalize your own program. #1. Always fuel your workouts! Even if you workout early in the morning, you need energy to last through your workout and maximize your efforts. Pre-workout snacks help reduce the depletion of muscle glycogen (energy stored in your muscles) and reduce protein breakdown. Try a simple snack 30-60 minutes before you get started, regardless of WHEN you workout. Or you may like eating a full meal 2 hours before you workout. #2. Include Protein & Carbs! *Protein pancakes: From the kitchen of Greatist contributor Laura Skladzinski, mix 4 egg whites, ½ cup rolled oats, ½ cup low fat cottage cheese, 1/8 teaspoon baking powder, and ½ teaspoon pure vanilla extract. Find more options at http://greatist.com/fitness/50-awesome-pre-and-post-workout-snacks. #3. Listen to Your Body! Everyone responds differently to eating, and it's no different when eating before a workout. So, make sure you listen to your body and determine what works for you. Maybe a liquid is better than eating whole foods before a workout. Maybe you do better if you have a full meal 2 hours prior to a workout instead of too close to your sweat time. Experiment with your timing and options, and then determine what helps you workout harder and feel better! #1. Always RE-FUEL your workouts! You have about 1 hour after your workout to supply your muscles and tissues with the fuel to repair and recover optimally. This can be a snack or a full meal, but a liquid protein shake is usually the simplest and most convenient option. Make sure you are drinking an extra 8-12 oz per 15 minute of exercise to your daily water intake. Your body needs the hydration to function and recover effectively and efficiently, as well as to burn fat! Adding FIBER to your healthy eating plan. 1. Fiber is the part of a plant that humans are not able to digest. 2. Fiber is important because it signals satiety genes, which tell you when you’re full and has no calories by itself. Fiber makes it possible to lose weight without feeling hungry. 3. Recommended intakes are 25 g/day for women, and 35 g/day for men. *Divide up your grams throughout, aiming for at least 5-7 grams per meal and 2-3 grams per snack. *Introduce fiber into your plan slowly to avoid GI distress. *Make sure to drink at LEAST 1/2 your bodyweight in oz of water to avoid constipation. 4. At least 25-30% of your fiber intake should be soluble fiber. oat bran, oatmeal, beans, peas, barley, citrus fruits, strawberries and apples. whole grains, cabbage, beets, carrots, brussel sprouts and cauliflower. 5. It’s okay to get 15-20% (4-5 grams) of fiber from supplements as needed, but whole foods are ideal. *Read food labels to determine how many grams of fiber per serving. Fiber is found underneath Carbohydrates. Your Net Carbs are equal to total carbs minus Fiber grams (see below). 1. Omega-3 fatty acids are fats found primarily in fish and fish oils (mono- and polyunsaturated). 2. Important role of fatty acids is to protect against heart disease, arthritis, allergies, cognitive loss, depression, diabetes and aging. 4. You need at LEAST 500mg-1000mg of EPA & DHA per day. 5. Aim for 4-6 servings of oily fish per week and/or take a fish oil supplement. *Salmon, mackeral & cod are best sources. *Avoid tilapia, catfish and tuna fish. Here's an example of what eating in the zone may look like (on a typical day for me). The key is to eat protein, carbs & fat in a 1:1:1 ratio, meaning for every serving of protein, there is an equal (or almost equal) number of servings of carbs & fat. You can play with the portions though to customize your plan to your needs. I've included a downloadable file for your convenience that includes a FOOD GUIDE, SAMPLE MENU & NUTRITION LOG. Feel free to print and make copies as desired. Spray skillet with non-stick cooking spray (or you can use coconut oil). Add spinach and tomatoes to pan. Cook until spinach is wilted. 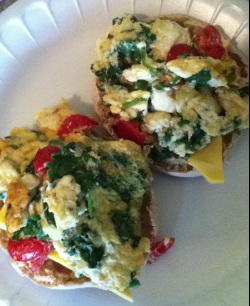 Add egg beaters and scramble until cooked completely. Split bagel (toast if desired) and spread 1.5 tbsp avocado on each bagel slice. Place egg mixture on top of avocado. Sprinkle cheese on top of egg mixture. Add coconut oil to skillet & cook chicken. Add beans and spices and simmer until heated through. Put chicken mixture in bowl and toss with avocado, ranch dressing & salsa. Top chips with chicken mixture. Bring water to boil and cook pasta as directed. Add coconut oil to heated skillet. Add ground turkey and spices and cook thoroughly. Measure out 3/4 cup pasta into a bowl and toss butter. Add 1/2 cup spaghetti sauce & 3 oz of ground meat. Top with 2 tbsp cheese and enjoy! One important element of maintaining a healthy eating plan is to cultivate healthy habits daily. 1. Eat every 3-4 hours to keep your body energized and metabolizing efficiently. 2. Eat your first meal within one hour of waking up. If you are not accustomed to eating breakfast, make it more like a snack, such as a protein shake or apple & string cheese. 3. Pick one day of the week to prepare your snacks (cut fruits and veggies) for the week in ziploc bags or containers. 4. 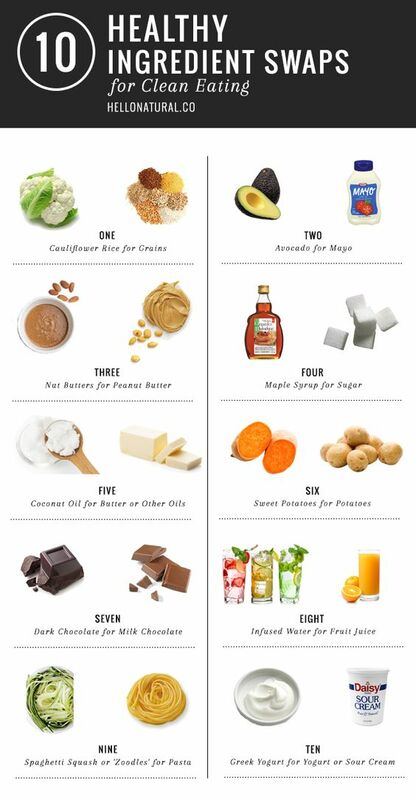 Try to make one healthy substitution a week. For example, using avocado instead of mayo in your sandwiches, replacing white bread with whole grain bread, or drinking iced tea instead of soda. 5. Choose fresh foods over packaged foods, such as fruits and veggies instead of chips or crackers. 6. If someone else is cooking for you and you cannot control the ingredients, control your portion sizes. Eat half of what you would normally eat. If you're eating out, choose the healthier options (grilled vs fried, steamed vs sauteed, veggies vs pasta/rice). 7. Eat your last meal/snack 2 hours before you go to bed. If you are still awake 3+ hours after your last meal, you may get hungry again and be tempted to snack. 8. Drink WATER--1/2 your body weight in fluid ounces is optimal for health. 9. Get your rest. Sleeping 7-8 hours every evening is ideal for health and weight loss. Studies show that lack of sleep increases the body's resistance to burning fat. 10. Plan your meals at least 3 days of the week. For healthy ideas to great tasting meals, visit www.dashingdish.com. There are 3 main macro nutrients we will focus on in the ZONE: CARBS, PROTEIN & FAT. So, it becomes necessary to read nutrition labels, which is important for whatever healthy eating plan you cultivate. I have included a chart with a more extensive list of foods and their serving sizes below for your convenience. *Please note that in the Zone, the average woman needs 3 blocks each of carbs, protein and fat per meal and 1-2 blocks of each per snack. The average male needs 4 blocks of each per meal and 2-3 blocks per snack. CARBS: (carbohydrates) include grains, vegetables and fruits. *Always choose whole grains/wheat WITHOUT ENRICHED ingredients. *Choose foods whose labels contain more FIBER GRAMS than SUGAR GRAMS. *Incorporate many colors of vegetables and fruits for more nutrients. *Have vegetables steamed, not sauteed. *Limit fruit juices, which usually are high in sugar and not as filling as fruit because they don't contain fiber. I use Barilla Plus varieties. I use Orowheat Whole Wheat. PROTEIN: includes meats, legumes/beans, and eggs. *Choose lean meats as often as possible. *Limit beef to 1-2 times per week. It takes 7 days for your body to begin to break down beef for digestion. *Eliminate fried meats as much as possible. Choose baked meats instead. *Choose deli meats over processed meats to avoid high levels of sodium; avoid meats with nitrates & nitrites. FATS/SUGARS: include nut butters, nuts, avocados, oils and sugars. *Limit saturated fats and added sugars. *Use coconut oil or cooking spray as much as possible. *Avoid fried foods as much as possible (or completely). *Eliminate or limit carbonated and high-calorie drinks, which have little or no nutritional value. *Drink 1/2 your body weight in fluid ounces each day. *Add 12-16 oz of water for every 15 minutes of activity. *Black/Green tea: add a tsp of honey or packet of truvia to sweeten if necessary. *Infused water: Add lemon, lime, cucumber, fresh mint, or sliced orange to a pitcher/glass of ice cold water. Discover simple ways to make eating healthy practical and enjoyable.